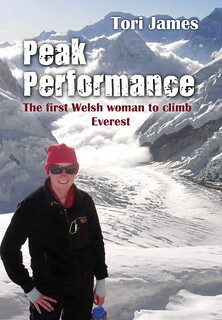 On 7 January 2013 you’ll be able to pick up a copy of Peak Performance, my first book. It’ll take you on a journey to the summit of Mount Everest, sharing the highs and the lows of my record-breaking adventure. The book will form part of the Quick Reads series, an initiative to introduce people to the pleasures of reading, to improve access to reading and to transform lives. “Suddenly I woke up in panic with the feeling that someone had punched me in the chest. But there was no-one there. The tent was still intact. Breathlesss and panting I gulped for air and tried to stay calm. I had been warned about a phenomenon called ‘Cheyne-Stokes’ which happened to some people at high altitude where your lungs ‘forget to breathe.’ I lay in my sleeping bag forcing myself to take deep breaths until I eventually fell back to sleep. We were now in the Death Zone and it would get even tougher from here”. Pre-order your copy of Peak Performance here.